Providing a good, sturdy, large cage can be a bit of a challenge for Gambian pouched rats. 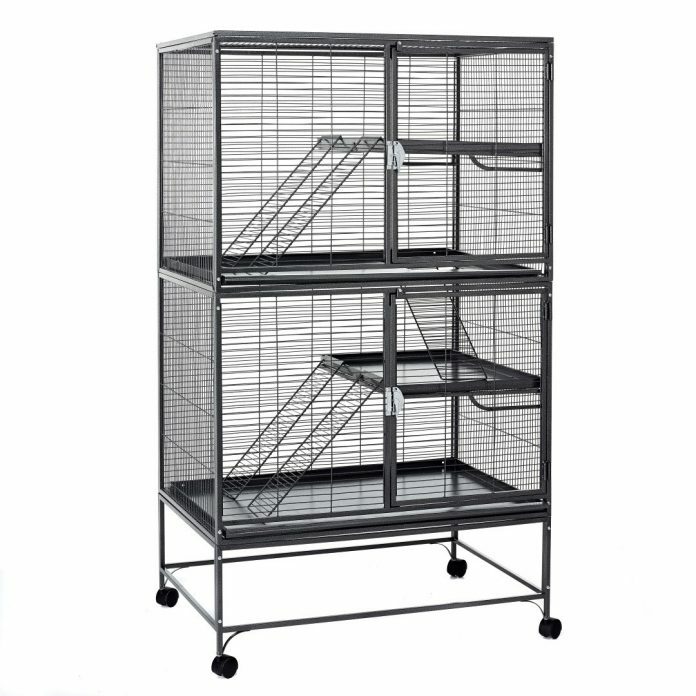 Pouched Rats need a large cage to ensure they have the space they need however, cage space is never a substitute for freeroam time. Not all Pouchies will want freeroam time, but all should be given the chance to do it. However, here are some of the basic requires for your pouched rat cage. A deep base is best however, a shallow tray with a fleece bedding is usually ok. Ensure they have a litter tray for wee’s and a large bowl of water for poops. Powder coated metal or stainless steel cage. Zinc can be ingested if chewing on galvanized cages. Avoid wood shavings as you would a fancy rat, We find that Fleece works perfectly well, especially if your pouched rat is litter trained. Provide them with a bed, wood is generally not suitable as some will wee in their bed. We find a corner litter tray for a rabbit is great or a small covered plastic rabbit house. Toys and Fun, hanging toys are great but non-toxic branches from fruit trees can be great, Apple tree branches can be hung around the cage, they can chew and run across at their lesure. Welcome to new Pouchies from Germany!